Well, that’s not likely. Like most topics, the answers are just a bit more nuanced. Let’s explore some pros and cons of each method, and you can choose the right one for your unique situation. That neat little lever on the left side is handy for not only locking the slide open for administrative and safety functions; it’s also convenient for releasing the slide and letting it fly forward, chambering a fresh round in the process. There are some benefits to this approach. First and foremost, it’s fast. In fact, it’s the fastest way to chamber a round from an “empty chamber and fresh magazine inserted” status. Your thumb is already likely hovering over that lever, so a fraction of an inch of movement completes the job. Movement is time, so fast times require minimal movement. You can’t accomplish this task with less motion than a quick push on the slide lock lever. On the con side of the equation, there are a couple of things to consider. Some pistols, especially compact ones, require a lot of pressure to operate the lever from an open slide lock position. The smaller the gun for any given caliber, the more spring pressure you’ve got to deal with. It’s an inherent law of physics related to managing recoil and semi-automatic operation. On some compact pistols, you may not be able to release the slide reliably at all using finger pressure on the slide lock. There’s also a potential issue of wear and tear on the slide lock mechanism itself. Many consider it to be exactly what the name says – a slide “lock” feature. When the slide is jammed against the slide lock lever under heavy tension, pushing that lever out of the way results in some metal-to-metal wear. When racking the slide, pulling the slide back causes the catch to drop out of the way (at least in theory), so the action doesn’t wear the slide lock catch as much. Last but not least, if you use different pistols, the lever will be in a different location on every model, so it’s difficult to train and practice a singular motion to complete this operation, especially under stress. From an open position, racking the slide causes the slide lock lever to drop out of the way enough to allow the slide to continue forward, pick up a fresh round from the magazine, and chamber it. The benefits of the slide rack method include the following. First, it always works. With any semi-automatic pistol, as long as there is at least one round in the magazine, pulling the slide back and letting it fly allows the slide to bypass the slide lock and fully close. 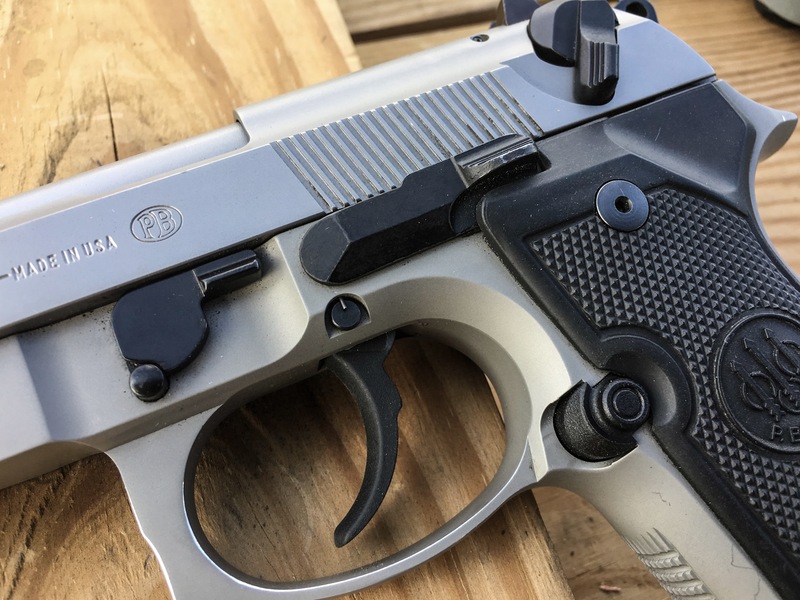 It also uses big muscles, and if you know how to rack the slide like a boss, it’s unlikely that you’ll have trouble operating any slide, even those on compact pistols. There’s also a case to be made for using the same motion for both administrative and emergency action drills like clearing a malfunction. The same moves make the gun ready to go bang. Simple is good. The biggest drawback to the racking method is that it requires more time. That's because it demands more movement. The racking method also involves the use of both hands. If you’re holding a flashlight, cell phone, or child with your support hand, it’s going to be a challenge to rack the slide. There are ways to do it but ingraining them into your muscle memory will take practice. In summary, the slide lock lever method makes a lot of sense if you use the same gun all the time and have no problem operating the lever with thumb pressure only. If the lever is large and under reasonably light spring pressure, it’s a fast and intuitive solution. I wouldn’t worry about wear and tear on the slide lock itself. Guns are tools, and in the rare event that you experience wear to the point of reliability problems, buy a new lever. It's an inexpensive part. If you have multiple guns or there’s a chance you may have to pick up an unfamiliar one in an emergency (say, your spouse’s) the racking method always works and may be your best bet. It uses big muscles and is arguably easier to perform under stress. Whatever method you choose, start using it consistently. You’ll be surprised at how quickly either can become an automatic movement.